We are seduced every time by the lush coconut-fringed exotic coastline of southern India, where a sense of the culture, charm, and vibrancy is in abundance- markets bustling with locals, ancient temples, a richness in nature, multicolored festivals- a place that is so deeply under our skin. Kerala’s cooking is fragrant, a culture that is famous for its coconut palms, seafood, spices and generous amounts of hot chilies. There is a real magic to the combination of spices they use, a harmony like no other- Our trips to far off places like India means laddening our bags with sacks of spices, colorful aromatic treasures to bring back to try and recreate dishes. 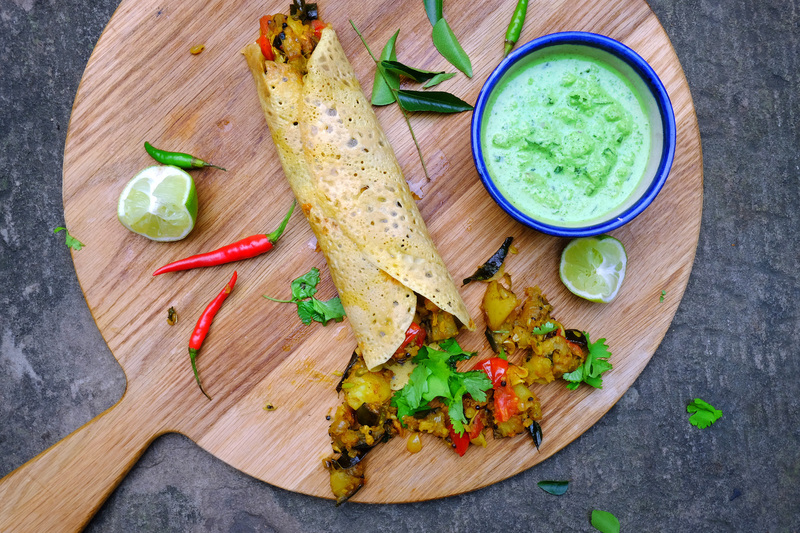 This is a bit of a cheat on the traditional southern Indian dosa, where you make the batter by grinding up rice, dal, Bengal gram and leaving to ferment overnight – which of course is authentic and really the right way to do it, but it’s also time-consuming when you just want to enjoy something like this as fast and easy food. We use gram flour, naturally gluten-free made from chickpeas, and water- as easy as that- and tastes (we think) as good as the real deal! We have also cheated with a coconut chutney, as if we find it a push to go out and buy a fresh coconut, then grate it- we are pretty sure the majority reading this will find that the case too. Soaking unsweetened desiccated coconut in a little hot water, to tenderize and adding to yoghurt with mint, coriander and spices is a speedy and clever little cheat to achieving a realistic coconut taste and grated texture.